If you’ve been reading all week, you should have been able to guess that this clip was going here. This wasn’t just random placement either it actually fits! 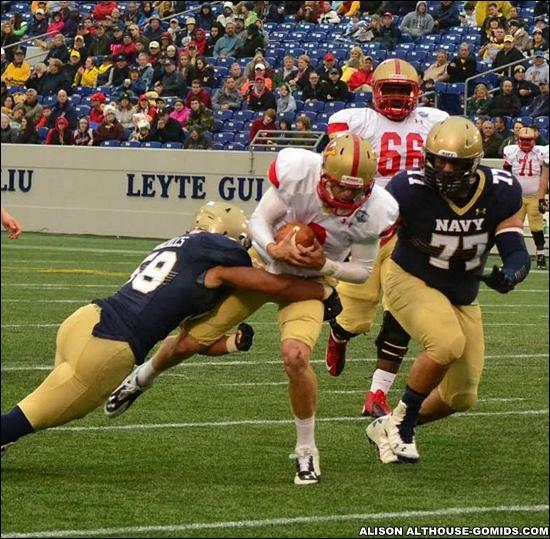 For the first time in over a century of playing football, the Navy Midshipmen will play in a conference, a.k.a. the “Danger Zone” apparently. However, the real danger is with the other teams in the conference because this Navy team is ready to compete. This triple option attack is difficult to prepare for, and that is a big reason why teams like Navy, Air Force and Georgia Tech are so tough to play. Navy and Georgia Tech also run it better than anyone else in the country. 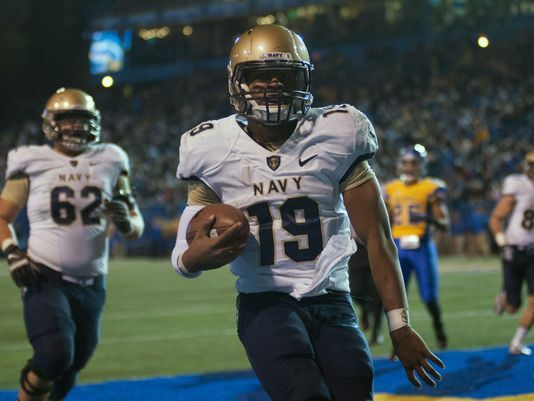 This season Keenan Reynolds will lead a potent Navy attack. Reynolds is the all-time leader in rushing touchdowns by a quarterback, and 14 away from the all-time FBS rushing touchdown record for any player. Obviously to run an option-style offense, you have to have, well, options. Reynolds will have to find three new starters in his backfield to run the vaunted triple option attack with, but he does have some pieces that have been good in more limited capacities. Chris Swain was the backup fullback last year, but still rushed for almost 700 yards on 6.7 yards per carry. Five different slotbacks come back who had ten or more carries last year. DeBrandon Sanders and Demond Brown had the most of the group and figure to start, but the other guys will get their touches. Dishan Romine is a guy to keep an eye on, he averaged almost ten yards per carry on 13 carries last season. Obviously that’s not sustainable with an increased workload, but that is evidence of explosiveness nonetheless. Passing the football is a significant afterthought for this offense, but should they decide to open up the offense a bit more it doesn’t hurt that last season’s leading receiver is back. Jamir Tillman caught 20 balls for 386 yards last year, which isn’t phenomenal by normal standards, but in this offense it’s significant. Offensive line may be a slight concern, but it is still plenty deep. The Midshipmen did lose three starters from last year’s line, but the two that return both have over 20 career starts. LG E.K. Binns has shown up on some preseason all-conference lists. All of the service academies have the same issue defensively, small front sevens. The reason for this is obviously that 300-pound guys don’t generally meet the qualifications for what the service academies are looking for off the field. The good news though is that Navy has a pair of nose guards, Bernard Sarra and Patrick Forrestal, that are almost 300 pounds, so they have more beef up front than they have in years past. With only one starter returning at linebacker, that beef up front may be more needed than ever, too. Navy typically has to use fast, run-stopping linebackers in its 3-4 defense, because of the now dead horse-level beaten point about the defensive line. They certainly have that with only two of the twelve linebackers on the roster topping 230 pounds. The problem is that Daniel Gonzalez, the returning starter, is the only sure thing at linebacker. Quincy Adams and Brendon Clements do provide a solid and experienced foundation in the secondary, though. The two corners combined to break up 13 passes last year. The last time Navy won ten games in a season was 2009, but they are ready to do it again in 2014. Unfortunately, I think they are just behind Memphis in the division, especially since they have to travel to Memphis. They also have to travel to Houston in their last conference game of the season, but given that it’s a Friday night game and it’s the week after Houston has to play in Connecticut I feel the short week may make it hard for the Cougars to prepare for Navy’s offense. Navy likely won’t be able to steal one in South Bend, but I’m sure any Navy fan would be more than thrilled with ten wins in their first year in the AAC.